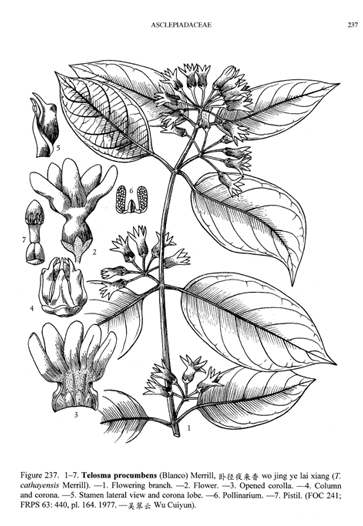 Puso-puso is a common name shared by Telosma procumbens (latok) and Litsea glutinosa (Indian laurel). CHINESE: Wo jing ye lai xiang. 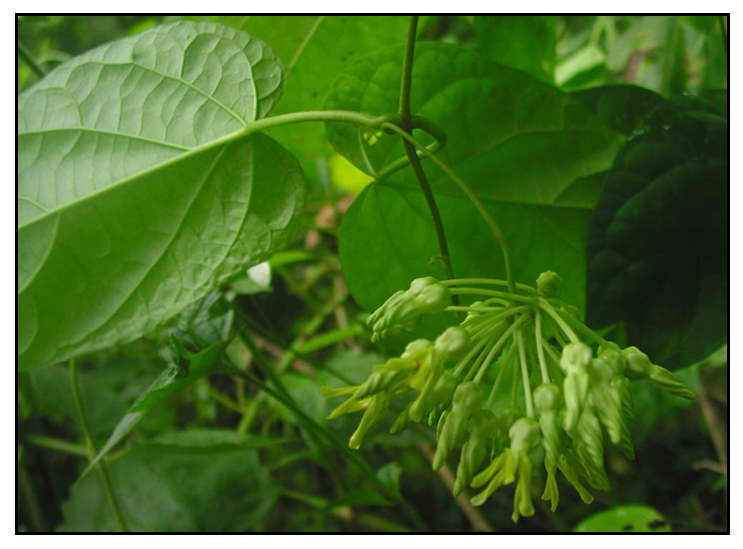 Latok is a woody vine with slender, smooth or slightly hairy branchlets. Leaves are thin, ovate to oblong-ovate, 8 to 13 centimeters long, 3 to 8 centimeters wide, pointed at the tip and slightly heart-shaped at the base. Cymes are axillary and umbelliform. Flowers are numerous, greenish-yellow, odorless, about 1.5 centimeters long, and hairy at the throat. Fruit is lanceolate, about 15 centimeters long. Seeds are flattened and crowned with silky hairs. - In thickets and secondary forests at low altitudes in Ilocos Norte to Sorsogon Provinces in Luzon; and in Mindoro, Cuyo, Biliran, Leyte, Negros, Mindanao and Basilan. - Also occurs in China and Vietnam. - Considered anti-tussive, expectorant, hypoglycemic. - Studies have suggested antioxidant, hypoglycemic, radical scavenging, sweetening properties..
- Flowers and immature fruits eaten cooked. - Pericarp is cooked and eaten as vegetable, with the consistency and taste of string beans. - In Albay, fresh leaves and stems have been reported to be poisonous to pigs. - In Ilocos Norte, immature fruit used for making dinengdeng. - Clustered inflorescence eaten as vegetable, sautéed and eaten with rice. - Decoction or infusion of leaves used for cleansing wounds, scabies and ulcers. - Leaves, as cataplasm, applied to the forehead for headaches.